Staff at Nebraska's Burke High School are investigating a reported case of bullying against a student who is deaf. 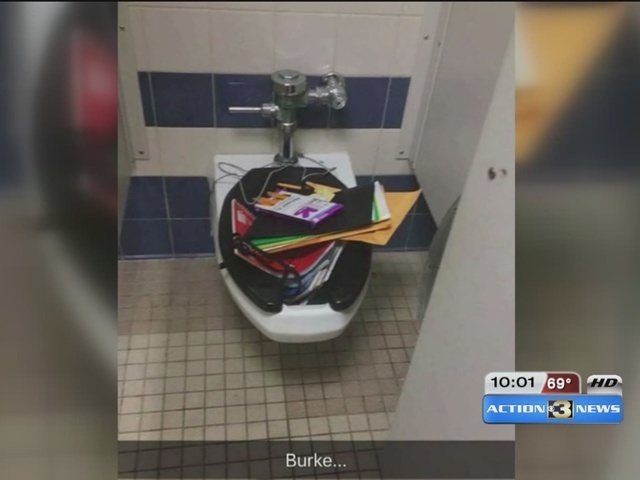 Someone took Alexis Hernandez's backpack during the lunch period on Wednesday and dumped his tablet, school supplies, homework and debit card into a toilet. The backpack also contained Hernandez's cochlear implant — without which he can't hear. Hernandez immediately told administrators his backpack was missing. They helped him look for it but were unsuccessful. School security officials reviewed surveillance video and saw two unidentifiable male students walk off with his bag. Hernandez apparently didn't know either of the students. "Those students think it's OK to bully a deaf student, but it's not. It's not OK to bully someone who is disabled, deaf or hard of hearing," Hernandez said. "Or anyone for that matter." Hernandez, who has been deaf since he was 1 year old, said he's been bullied and joked about for years because of his disability, but added this whole incident has left him feeling unsafe to go back to school. "This just got out of hand. There's too much bullying, too much drama, too much fighting, it’s just not nice," Hernandez said. What upset him the most, was that the bullies ruined his English class project. ”I was very upset because I know I work really hard on my project and homework because I just want to make my mom to be happy and know that I did a good job on the homework," he said. Hernandez's mom told Omaha's KMTV that school administrators were able to identify the two students who took her son's backpack. They claimed they didn't know he was deaf. Hernandez's mom was also told one of the students was suspended; the other is apparently still under investigation by the school. ”I just want to talk to them; I don’t want to fight them. I want to talk it out. And talk to their parents about them so they can tell them they need to teach them the right thing to do,” she said. Hernandez was able to retrieve his belongings, but some were damaged. Some of his friends set up a GoFundMe page to raise money to replace the ruined items. That account has since been closed. Omaha Public Schools has released a statement about the incident, saying, in part, that they take matters like this "very seriously."